Artist Eva Mantell applies meticulous attention to materials that are on the verge of being discarded. The resulting artwork is complex, highly ordered and the humble materials are lent a poetic weightlessness. The organizing principles that generate her constructs are deceptively simple. She sets rules or parameters, which when followed or repeated, produce complex results. Her studio production is process-driven in that the final result is not known at the start, but rather produced by intuitively following the simple rules she sets out for herself. Turing Patterns taken from David A. Young’s Article, A local Activator-Inhibitor Model of Vertebrate Skin Patterns, Mathematical Biosciences, Volume 72 issue 1, November 1984, page 51. She likened her approach to art to Alan Turing’s approach to understanding the morphogenesis of flowers. Posing the question “How does a flower know how to become a flower?” Turing spent the last years of his mathematical career looking closely at ordinary flowers. His mathematical inquiry into biological morphogenesis worked with simple pairings of activators and inhibitors that behaved in predictable ways but produced complex results as they interacted over time. Similarly Ms. Mantell observes ordinary things, applies simple parameters to generate conceptually and aesthetically complex results in her artwork. With Cloud Map, Ms. Mantell started with a cigarette advertisement from a magazine. She imposed the restriction of using only her bare hands to create a drawing; no tools or other materials were used. Then she set out to remove as much material as possible while still retaining the structural integrity of the original sheet of paper. The results closely resemble Turing patterns. A torn hole could never be too large or the integrity of the underlying image would be destroyed; neither could the supporting matrix remain too thick or the challenge of removing as much material as possible would not have been met. Although the holes were torn in an intuitive manner, one could imagine that “completeness” was the inhibitor and “removing” was the activator. There is an emotional quality to the act of removing. The substrate, already disposable, moves towards fragility. Being damaged while remaining recognizably whole has parallels with being ill or wounded and yet continuing to live. The sense of vulnerability is underscored by leaving only the nicotine warning intact and legible. The touch of the hand is key to understanding the artwork. At first glance Nicotine appears to be a perforated and colorful lattice. Closer examination reveals the nearly disposable substrate and the patience evident in the handwork. The careful attention and repeated touching of the material elevates the sheet of paper out of the realm of rubbish into the realm of a carefully realized work of art. 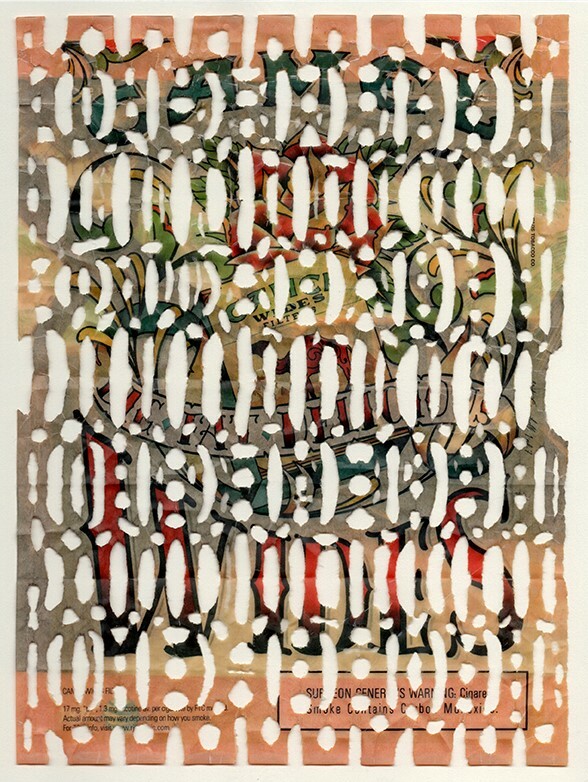 In this sense Ms. Mantell’s work is transformative, use mundane materials to reflect on the nature of transience. Another body of work was the project transforming discarded paper coffee cups into space filling sculptural objects. She set herself the challenge of making the cup occupy as much volumes as possible without either adding or removing materials. Many of the artist’s solution approach surface filling curves before being expanded into a elaborate brambles resembling tumbleweeds or feathers. Starting with a familiar object on the brink of its own extinction, she expands it to occupy more time, in the form of her careful attention to it, and space. By exploring simple principles with a meditative and deeply human eye, Eva Mantell explores pattern in nature using materials that refer to our everyday lives. The patience and care with which she attends to disposable objects makes us question our relationship to the human detritus our culture thoughtlessly produces. Her work gently but clearly underscores the importance of noticing the overlooked and finding structure and beauty in the ephemeral. 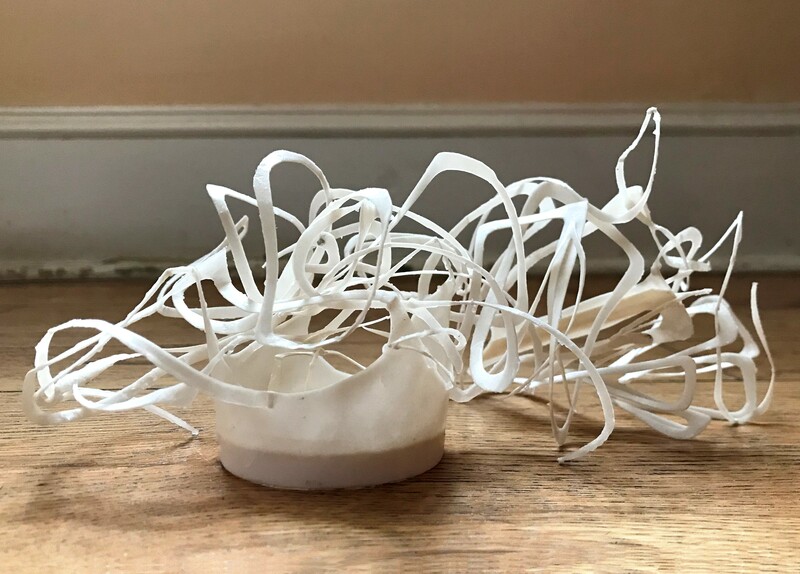 Eva Mantell: lives in Princeton, NJ and has exhibited her sculpture, painting and video at the Monmouth Museum, the Hunterdon Museum, the Bernstein Gallery at Princeton University, the Abington Art Center, the Jersey City Museum and the Brooklyn Museum of Art. She has a BA from Penn and an MFA from the School of Visual Arts in NYC. She curates, teaches and speaks about art including the recent Art as Activism, at the exhibit Fight or Flight at The Painting Center, NYC. She has a special interest in arts engagement and community outreach and her teaching has been included in Designing and Delivering Arts Programs for Older Adult Learners, published by the National Center for Creative Aging in Washington, DC. In January 2018, her work will be on view in a group exhibit in Brooklyn, NY at http://soho20gallery.com/ Eva’s website is evamantell.com.